You wanna learn how to Crochet I-Cord? Not a problem! 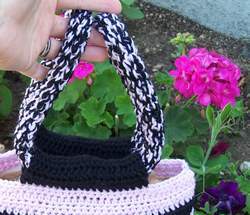 Here, you will find FREE and EASY instructions with pictures for crocheting i-cord for your next bag or purse project. I too was one of those who was not sure how to accomplish that same great look using a hook instead of two needles. 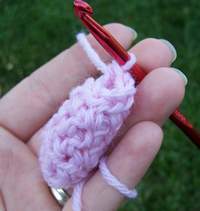 Therefore, I decided I would once and for all answer the burning question,'how to do a crochet i-cord'. What is I-cord used for? I-cord is often used for handles, drawstring, trim and decoration on purses and bags. I love the way it looks when used in knitting and wanted to explore possibilities for using it in crochet. 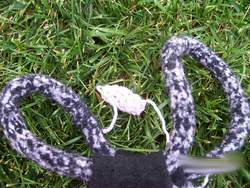 Specifically, I thought because, generally speaking, crocheted fabric tends to be bulkier than knitted fabric a crocheted i-cord would be even more sturdy and strong for purse handles! With your crochet hook and yarn chain (ch) 4 sts. 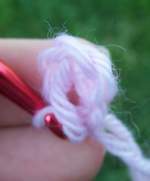 Slip Stitch (sl st) to the first ch creating a ring. 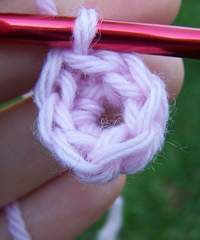 Half Double Crochet (HDC) into ring 7 times. Join to first HDC with a HDC (this will create a spiral effect). Then, HDC into each HDC around until piece measures your desired length. To finish, sl st into the next stitch and finish off. Little Tip: before you finish off the last stitch you could thread piping into the i-cord and give it even more stability. You have completed a crochet i-cord! if you want to connect or sew the ends of your i-cord together and create a continuous loop through flaps made on the top of your bag. Yet another option, if you used 100% wool yarn you could felt the i-cord and make it even stronger! Little Tip: If you hold two strands of yarn together you end up with an even stronger fabric and it will work up faster (who doesn't like that?). 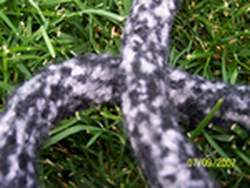 It is best to do this when making these handles to carry a fairly heavy purse or if you are going to felt the i-cord. Make it a little more fun and funky by using two different colors together. This will create an even more interesting handle that looks like you spent hours on colorwork and all you did was hold two different colors of yarn together! Now that you know how to crochet i-cord you are ready to learn how to knit i-cord.